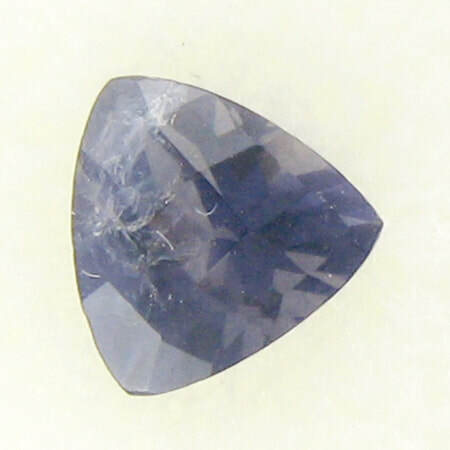 Iolite is the transparent, gem version of the mineral cordierite. The name "iolite" comes from the Greek "ios" meaning violet. It has a property called pleochroism which means the color of the stone differs depending on the direction in which it is seen. Overall it appears to be a violet-blue gem. However, when seen from different directions it may appear honey-colored or an almost clear blue. At one time it was known as "water sapphire" because when looking at it from one direction it appeared sapphire blue and from another clear as water. According to Norse legend, Vikings used thin pieces of iolite as a polarizing filter to help them find the sun on a cloudy day and thus navigate safely across the seas. It is believed the Vikings found iolite deposits throughout Norway and Greenland. Iolite is believed to help you discover lost parts of self. It is thought to be a stone of vision and creative expression. Care: Clean with warm, soapy water and a soft cloth. Be sure to rinse thoroughly. Do not use steam or ultra-sonic cleaners.